Common Name: Salvia root, Red sage root, Red-rooted sage. Part Used & Method for Pharmaceutical Preparations: The roots are dug in autumn, and then cleaned, soaked, cut into slices and dried in the sun. They can also be fried with wine. Meridians: Heart, pericardium and liver. 1. Internal blood stagnation manifested as irregular menstruation, amenorrhea, abdominal pain or postpartum abdominal pain. Red sage root (Danshen) is used with Motherwort (Yimucao), Peach seed (Taoren), Safflower (Honghua) and Chinese angelica root (Danggui). 2. Qi and blood stagnation manifested as cardiac pain, abdominal pain or epigastric pain. Red sage root (Danshen) is used with Amomum fruit (Sharen) and Sandalwood (Tanxiang) in the formula Danshen Yin. 3. Carbuncles, furuncles and swellings. 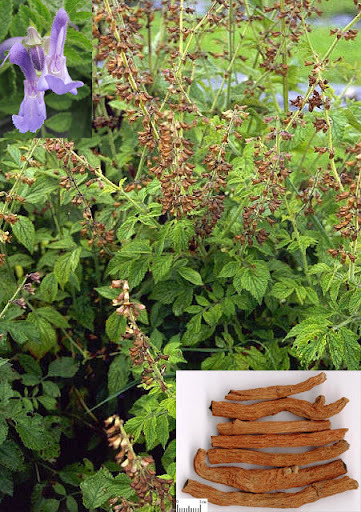 Red sage root (Danshen) is used with Honeysuckle flower (Jinyinhua), Forsythia fruit (Lianqiao) and Frankincense (Ruxiang) in the formula Xiaoru Tang. 4. Blood stagnation manifested as general pain or joint pain. Red sage root (Danshen) is used with Chinese angelica root (Danggui), Chuanxiong rhizome (Chuanxiong) and Safflower (Honghua). 5. Febrile disease with pathogenic wind invading the nutritive level manifested as high fever, irritability, dull maculopapule and a red or deep red tongue proper with scanty coating. Red sage root (Danshen) is used with Fresh rehmannia root (Shengdihuang), Scrophularia (Xuanshen) and Bamboo leaf (Zhuye). 6. Deficiency of nutritive blood with internal heat manifested as palpitations, irritability and insomnia. Red sage root (Danshen) is used with Wild jujube seed (Suanzaoren) and Multiflower knotweed (Yejiaoteng). Dosage: 5-15 g, decocted in water for an oral dose. If this herb is stir-baked with wine, it has a stronger effect for promoting Blood circulation and eliminating Blood Stasis. Cautions & Contraindications: Blood invigoration is enhanced by frying with wine. Do not combine with the herb Black false bellebore (Lilu).